Sixty years is a long time in any person’s life or relationship. As a fixture between two rugby clubs from different countries, sixty years certainly represents a very long association and one that has survived the changes through the professional era. 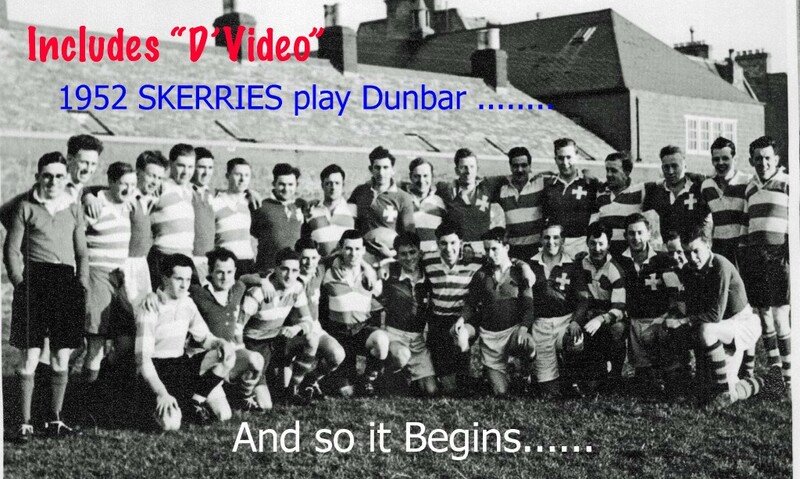 This weekend Skerries RFC (Dublin, Ireland) and Dunbar RFC (Edinburgh, Scotland) celebrate “Sixty years” of continuous rugby fixture which has been at the forefront of their respective rugby calendars. In early1952, a request was made to Skerries RFC by Dunbar Rugby Club to host a pre international game on the eve of the 5 Nations international match. Skerries kindly accepted the fixture and on the 23rd February 1952, the first fixture took place at Holmpatrick. Skerries first trip to Dunbar itself was memorable for the fact that they flew, chartering a 32 seater Dakota from Aer Lingus. It is now culminating in the 60 fixture between the clubs on Friday 9th March 2012 at Holmpatrick, Skerries. Over the years, there have been many modes of transport for the travelling party, stories of lost groups, train and plane journeys, people making every effort to be there for the Dunbar / Skerries weekend. It certainly is an honour for both clubs and to those individuals who had the foresight to keep running the fixture throughout all these years. Today we can look back on those sixty years and salute individuals like Andrew “Sandy” Heffernan, Des Cashell (Skerries) , Rubert Chalmers Watson, Douglas Rennie (Dunbar) and many, many more that put their energies into keeping the fixture alive and making it the longest continuous running fixture between two Clubs from Ireland and Scotland. For those who don’t know these clubs, there are a lot of similarities. Both clubs reside on the East coast of their respective countries; both towns are about 20 miles of their respective capital cities and look out onto well known landmarks. If you walk out onto the viewing balcony at Skerries, behind you are the 3 well known islands of Colt, St Patrick’s & Shennick Islands and further in the background is Lambay Island & Rockabill Lighthouse (no longer occupied, a very picturesque landscape. Dunbar’s well known landmark is The BASS Rock which overlooks the harbour as well as Dunbar’s British Open qualifying Golf Course and the large building of Torness Power station which is situated south of Dunbar. For those who have played in Holmpatrick, Skerries certainly during the winter months, you will recall the howling wind and the waves crashing over the sea wall, never a pleasant place to play in those conditions but Skerries would also use to their advantage. Dunbar with their elegant small Clubhouse at Winterfield (beside the golf course) definitely had similar features, open, windy and not conducive to open running rugby. Dunbar rugby has now moved from the holy grail to new facilities in Hallhill, Dunbar and share with the hockey & soccer clubs. You certainly miss the old elegant clubhouse and its view of the North Sea. When you have a fixture that currently runs 60 years and hopefully many more, you have to commend the characters that have come and gone that have made this fixture as solid as cement. Notable there were many names in the early years but would be unfair of me to single out any particular persons. The respective Clubs know who those people were and have honoured accordingly. It’s up to the current crop of characters to keep the reins held for the 60th anniversary and beyond, continuing the good work and friendship that its predecessors started. The fixture is always played on the Friday prior to the international matches; the match is played in a competitive but friendly manner. You might say the score is irrelevant but if you were to ask the players, the answer is “this is the one you want the most”. After the final whistle and shower, it’s the best down time to catch up with old friends over a beer or two. Conversation on – How is the family since last time, how are the clubs doing, looking forward to the dinner and international match etc. You always know this fixture will continue because every year we meet up, people catch up so quickly and express their appreciation of the fixture and are always planning for the next one. The last amateur bastion of rugby is “Alive and Well”. Quickly on the dinner – the chat and friendship continues, toasts are made by the respective Presidents and the “Shield” is passed to the winning captain, while the losing captain is provided with the wooden spoon. When at that top table, it’s always an honour and that is mutually respected by those who sit in the trenches and throw the odd joke, song and sometimes the bread buns. Dinner over, players, alickadoos & friends take refuse in corners and continue the chats & stories, This part alone makes the whole weekend, time to put your arm around the person next to you and make your Celtic partners welcome and cement the relationship further into the history books. One point worthy of a mention was that in 1976, the match was actually played in Skerries on the local Skerries Harps pitch and Dunbar boasted two Scottish Internationals in the Calder brothers. A day to relish for those privileged to play that day and one for the memory bank. Over the sixty years, the number of victories by each team probably reflected where they stood in their respective leagues. In the early exchanges, Dunbar had the upper hand but it was only in 1973 when the new & now famous Skerries Town’s cup team came to the fore in Skerries that Skerries stretched ahead with an unbeaten run of 17 victories. The later fixtures have edged in Dunbar’s favour. The current position of wins is SKERRIES 36 – DUNBAR 23. Who will win the 60th Fixture and set the tone for the next generation? You may ask what’s so different to this fixture than any other club match. Clubs make a conscious decision as to how and where the Club should be maintained, direction which must be inclusive of all members. The future of professional rugby will still be there for all budding good rugby players. Look at the Lions trips and those especially in the 60’s & 70’s, friendships were cemented between characters like McBride, Mulcahy, Slattery, Gibson with the Welsh, Scottish & English counterparts, lifelong friendships which when asked will always put down trips like theses as part of the life experience and treasured memories. Skerries & Dunbar are like a mini Lions trip, forged friendships, sixty years of playing rugby, sixty years of making new friends and sixty years of travel. The fixture has withstood many changes in lifestyles on both sides of the Irish Sea during the course of the 60 years and it’s has been successfully handed on from generation to generation. It has successfully weathered some difficult days and has blossomed on more benign days, may it continue to flourish in the future as an annual celebration of sport in general, of rugby in particular and of our common Celtic roots. I would like to take this opportunity to thank the Irish & Scottish Rugby Unions for recognizing this long standing fixture between Skerries and Dunbar and that to say to the members of both Clubs – you have a proud history behind you, your predecessors laid the foundation for this trip/fixture and to date you have embraced this gift of friendship across the Irish sea, long may it continue. Yours in sport and friendship.